The word whisky was originally derived from the Gaelic 'uisge beatha' - appropriately meaning 'the water of life'. 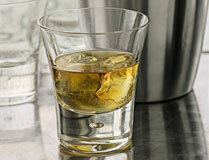 Single malt whisky is made from water, malted barley and yeast. The huge variances in production methods and the location of the distillery combine to ensure that each distillery produces its own distinctive style and character. Island malts are quite diverse as the region stretched from the Isle of Skye to the Orkneys, but they're typically full-flavoured, with a slightly salty character - an influence from their seaside locations. Their flavours also typically have hints of smoke and peat. Enjoy a glass after dinner or as a night cap. Try Talisker - a wonderfully powerful malt, bottled at above average strength. Islay is home to the strongest tasting of all malts. The influence of the peat which makes up the island, can be found in both the water and the kiln-drying of the malt. Islay malts also have a seaweed, iodine-like flavour, often attributed to the influence of the sea as the whisky matures. An excellent after-dinner drink. Try Bowmore - the smoky palate of this auburn coloured malt is balanced by heather honey sweetness and soft fruits, even chocolate. The style of Highland malts varies enormously, as much as the landscape of this large region, which stretches from Wick to Glasgow. The countryside influences the flavour, with notes of heather in the north and a progressive move towards sweeter, floral flavours further south. A good pre-dinner drink. Try Royal Lochnagar - the distillery earned its Royal Warrant in 1848 when the distillery manager invited Queen Victoria and Prince Albert to a tour and tasting. It became the Queen's favourite whisky. The greatest concentration of distilleries is in Speyside, where over a quarter of Scotland's distilleries can be found. Complex, diverse and elegant, they vary from lighter-bodied to heavy, rounded malts, all tending towards fragrance, fruitiness and sweetness, sometimes from the influence of old sherry casks. Try Glen Elgin - mouth-filling, rich and weighty on the tongue, it has plunging flavours of baked fruits, liquorice root and Seville orange, leading to a rousing but cleanly pungent finish.